Koi are bright and colorful fish, popular in the aquarium hobby. But because koi reach about 2 feet in length, outdoor ponds are the ideal place to raise them. 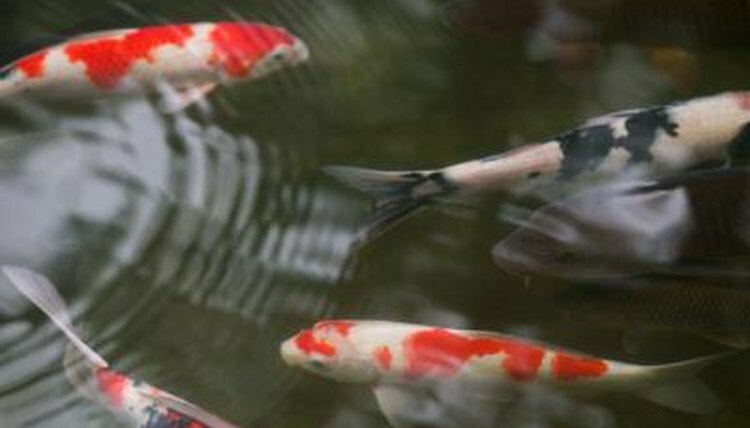 When it comes to koi eggs and their tiny koi fry, the survival rate in a pond can be quite slim. Removing the eggs or newly hatched fry will increase their odds for survival. A female koi fish will lay about 100,000 eggs per kilogram of weight. She'll lay the eggs randomly over the pond walls, on the surface of the pond and on any available plants. Because female koi lay their eggs randomly throughout the pond, it can be hard to gather them up. If you leave the eggs in the pond, some will be eaten by the adult fish and some of the eggs will survive. Once the surviving eggs hatch, it'll be easier to collect the koi fry and raise them in an aquarium until they're large enough to be placed in a larger body of water. If you prefer to gather the eggs before they hatch, you may want to consider using a spawning rope. Spawning ropes entice female fish to lay their eggs in a specific place in a habitat. Once the eggs are laid, you can collect the spawning rope and place it in a separate aquarium or you can leave it as is to let the eggs hatch naturally. If you let the eggs hatch in the pond, the spawning rope will protect the eggs, increasing the survival rates. You want to place the rope along the walls of the pond for your female koi to deposit eggs. You can buy commercial spawning ropes made with synthetic bristles, or you can make a spawning rope with nylon rope by threading half-inch pieces of rope between the strands of a 4-foot piece of rope. If you’re using spawning ropes and plan to remove the eggs to incubate them in a rearing aquarium, keep a close eye on your female fish. When you notice the eggs have been deposited, remove the rope and replace it in a 100-gallon aquarium just deep enough that the surface of the water is 2 inches above the top of the rope. Use an air stone on the surface of the tank to aerate the water, which will help provide oxygen to the eggs. Maintain the water between 68 and 71 degrees Fahrenheit. Extreme temperatures can cause fry to have physical deformities. After about five days, the eggs will start to hatch.